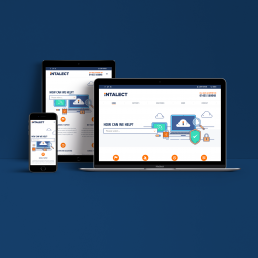 Intalect a local IT support company got in touch regarding a brand refresh and a modern new website. Within an initial meeting, they said how much they liked our friendly branding along with our robot mascot. Taking they’re existing logo and colour scheme we refreshed with a softer new typeface and introduced a more friendly navy blue to replace the harsh black, that had been used previously. This was matched with a series of vector illustrations that gave the company a more engaging and welcoming voice, altering the perception that IT is dull. This look and feel was then translated into a website built within Wordpress, this allowed for the client to take control of the website in-house after it had been built. The website incorporated features such as ‘why work with us’, a team profile and a blog, again allowing the company to connect with its audience and current clients. The site was built responsibly and was optimised for search engines, the site now appears first when searched locally.